Sausage and Apple Skillet Meal – Marie, Let's Eat! One of the most interesting meals that Marie has prepared recently has had me craving it again. Here’s her story about how she put it together. Sometimes you want to make something, and there isn’t a recipe out there that exactly matches what you want to do. 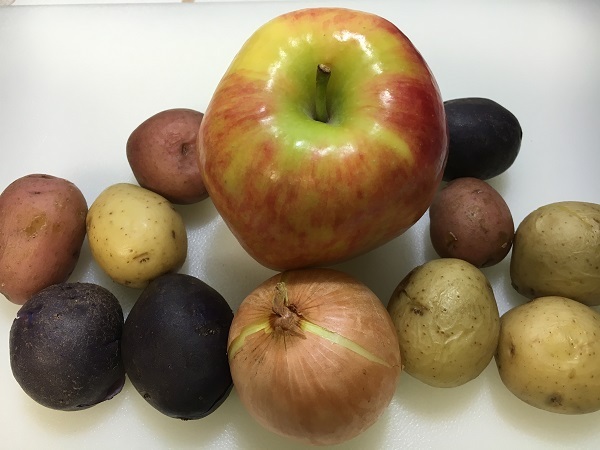 Maybe there’s an ingredient you don’t like in the closest version, or you want to have a slightly different emphasis on the ingredients – whatever it is, you need to improvise. 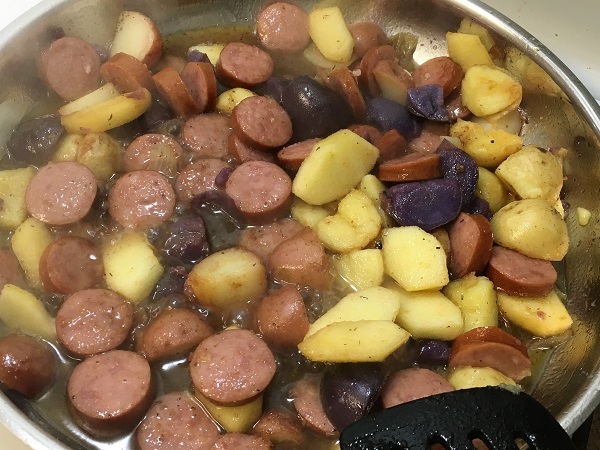 I wanted to make a sausage and apple and potato skillet meal. It seemed like a fairly simple request of the Internet, but every recipe I found was just not quite right. So I took two that I liked the best, used them for inspiration, and cobbled together something from them! a dash of Italian seasoning blend, pepper, and paprika. Melt the butter over medium-high heat and add the onion. 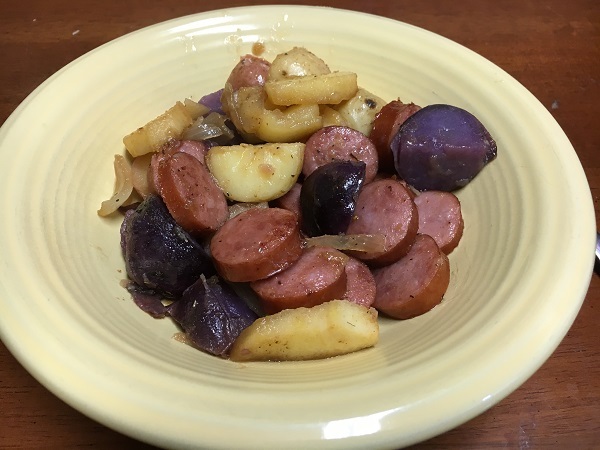 When it has started to soften, put in the potatoes and apples and however much mural of flavor as desired (it’s a salt-free blend, but the recipe itself isn’t low salt because of the sausage) and some Italian seasoning, to taste. Add a little pepper and/or paprika as desired. 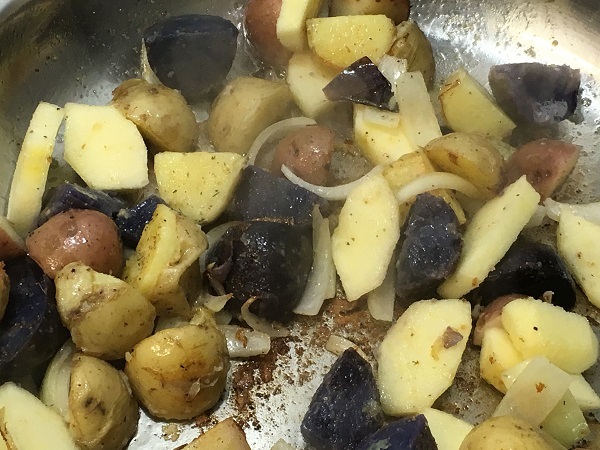 Stir infrequently to let the potatoes and apples get some browned edges. When they are a little short of how done you want them to be, throw in the sausage rounds and stir everything up, then mix the vinegar and sugar to dissolve. Pour that into the pan and toss to coat. Cook just enough longer to let the flavors blend, and serve with garlic toast. Next time I make this I would do the potatoes, apples and onions in one skillet and the sausage and vinegar in a saucepan. That way the crispy edges stay crisp, and the sausage can soak in the vinegar a bit longer! I might also add some diced sweet peppers to the potato mix. Posted on January 13, 2017 August 28, 2017 by Grant G.Posted in marie writes, our kitchenTagged cooking, marie writes, our kitchen.